Full Intensity Controlled rheostat cap that allow the light to be turned on at ANY power level. Full intensity controlled adjustable power output of the LED combined with Zoom / Focus give you absolute control of light output and light intensity depending on the situation and your night hunting style. A48iC Bezel Diameter: 48.0 mm / 1.89 inches. A48iC Body Diameter @ scope mount: 25.0 mm / 1.0 inch. A48iC Weight one battery installed: 11.3 ounces. A48iC Length: 178.0 mm / 7.0 Inches. A48iC Length bezel extended to MAX zoom: 188.00 mm / 7.40 Inches. Warranty: Limited Lifetime on light Housing. LED assembly three years. Accessories (batteries and charger, mounts, tail caps, cases, etc) one year. See manual for details and limitations. The A48iC features a full intensity control tail cap with the ability to power the light on at any desired intensity level. The A48iC LED assembly features a 3-year warranty, and can be changed in the field in less than 20 seconds for those wishing to use or experiment with a diffident led color. 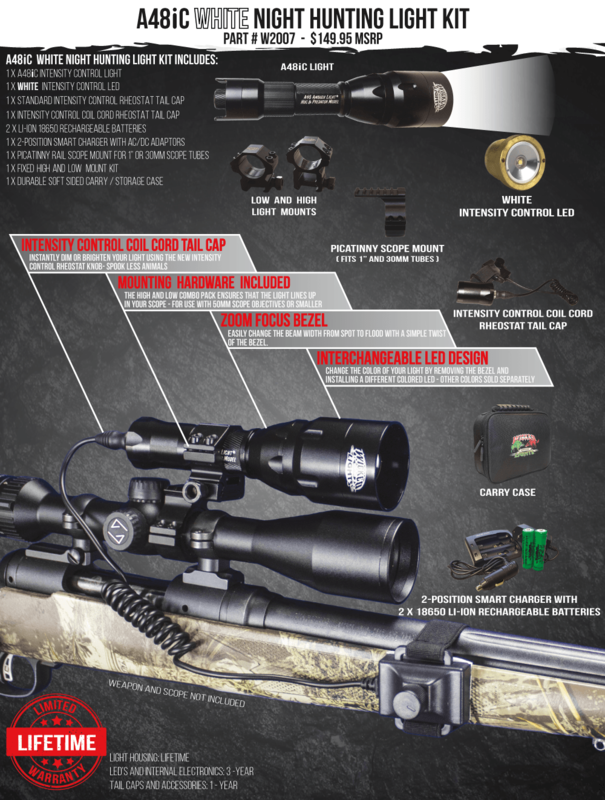 Weapon mounted light kits include picatinny style scope mount for use with 1 inch or 30mm tubes (also can be used to mount light on shotgun mag extension on many shotguns) and 2 light mounts (1 low mount for use with 40mm objective scopes and 1 high mount for use with 50mm objective scopes). *Approximate battery life using high quality, fully charged, Wicked Lights 18650 3.7 Li-Ion 2600ma battery. Note: Battery quality varies widely between brands and ma ratings are often grossly exaggerated on cheap batteries.